"The only way to learn mathematics, is to do mathematics." At English Martyrs Catholic Primary School we believe that a high quality mathematics education is crucial. When children are taught mathematics well, they are able to understand the world around them, reason mathematically, and they develop a sense of excitement and curiosity about the subject. We teach mathematics in a creative way, linking it to other subjects where possible, in order to enable children to understand and appreciate relationships and pattern in number and space. Mathematics is essential to everyday life and necessary to nearly all forms of employment, particularly in science, technology and engineering. It is with this in mind that we endeavour to ensure that all children develop a healthy and enthusiastic attitude towards mathematics that will stay with them throughout their life. To understand the importance of mathematics in everyday life. To develop a deep and lasting love of mathematics. As a school we follow White Rose Maths for children in Key Stage One and Key Stage 2. The White Rose schemes of learning are designed to support a mastery approach to teaching and learning, as well as to support the aims and objectives of the National Curriculum. The White Rose schemes have number at the heart and a lot of time is spent reinforcing number to build competency. It also provides opportunities to build reasoning and problem solving into each lesson. The White Rose schemes support our belief that all children, who are introduced to a concept, should have the opportunity to build on their abilities by following a concrete-pictorial-abstract approach. Concrete – children should have the opportunity to use concrete objects to help them understand what they are doing. 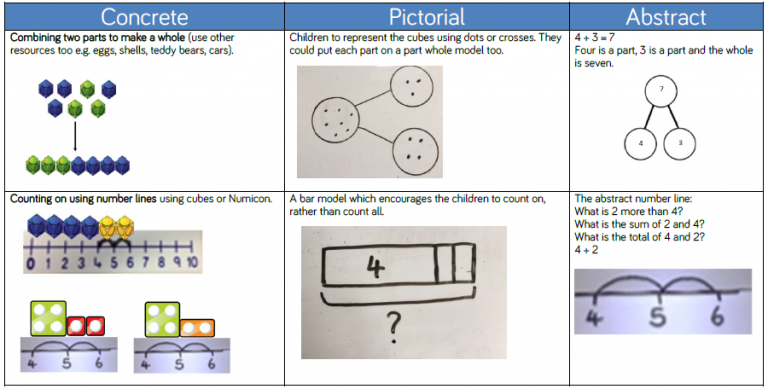 Pictorial – alongside this children should use pictorial representations. These representations can then be used to help reason and solve problems. Abstract – both concrete and pictorial representations should support children’s understanding of abstract methods. Below are the key skills we focus on in each year from Year 1 to Year 6. Please read our handy leaflets for families to help support your child at home with their maths.